Updated: 2017-06-28. Something not right? Please update the information. Hiking trails, formal campfire circle, chapel, compass course, pioneering supplies, archery, riflery, sledding, mountain bike trail, skating rink, volleyball, sports field, fishing, sailboats available, lake frontage, canoeable water, canoes available, kayaks available, section summer camp program. Camp Wheeler is located on Lake Kabakwa in the Haliburton Highlands. The camp has a forest, two swimming areas, several cabins, a dining hall with kitchen, shower house, and laundry facilities. 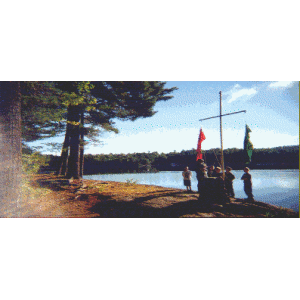 The camp has canoes, rowboats, kayaks, archery range, sports field, a sandpit for horseshoes or volleyball, a Chapel Among the Pines, two campfire circles, and flagpole. Camp Wheeler's summer program offers a unique blend of traditional and modern Scouting activities. Camp programs are based on the Scouting Promise and Law, and youth are encouraged to participate fully at all times. Campers develop outdoor skills, leadership abilities, and confidence in themselves. As well, they will experience the fun and excitement that creates lifelong friendships and cherished memories. Other troops are allowed to join in with the existing summer camp program or book the site around the existing program. The camp started in 1948 when Harry Bryant and three Scouts trekked to Macs Point on Lake Kabakwa, then called Peach Lake. Only 2 other cottages and another small boys camp existed at that time. There were no phones, no roads. The camp soon flourished.